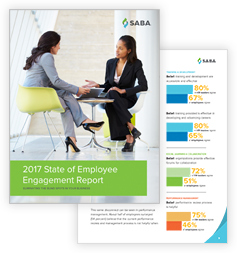 While most organizations agree that talent is their most important asset, the results of Saba’s 2017 Employee Engagement Survey reveal that most businesses are not in tune with employee perceptions. Nearly two-thirds of employees don’t believe they have an effective platform to engage with the business and share their input. Just 22% of employees say their organizations are very effective in providing easy access to training and development. Over half of employees feel performance reviews are ineffective when it comes to improving their personal performance. The 2017 State of Employee Engagement Report delves deeper into the survey results, providing research-backed insights you can use to close the critical perception gaps that still divide HR executives and employees when it comes to talent management.